Provide comfort for the family of Patricia Whalen with a meaningful gesture of sympathy. Patricia Carolyn Whalen (nee Hepler), age 71, of Maple Shade, NJ passed away while surrounded by loving family on Friday, January 4, 2019. Mrs. Whalen was born in Philadelphia, PA to the late William Isaac Hepler and Anna Madison Smith on November 30th, 1947. 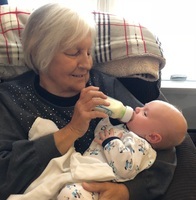 A loving and incredibly strong mother and wife, Pat enjoyed spending time with her husband, baking cookies with her granddaughter and she was over the moon with the recent arrival of her grandson. A long time lover of the ocean, she was able to spend her last months watching the waves and smelling the ocean air. Patricia is survived by her beloved spouse of 39 years, Thomas W. Whalen; children, Kelly Ann Moyer (John), Thomas V. Whalen; brother, Bill Hepler (Lois); sister, Barbara Stauffer (Russell); grandchildren, Ella and Richie Moyer; sister-in-law, Pat Kapuscinski (Edward); and many nieces and nephews. I met Pat 43 years ago when I started dating her brother, my husband Bill. I was and still am impressed with her kindness. She went out of her way to accept me into the family. She was so great with our boys and always treated them special. Billy and Adam loved Aunt Pat and Uncle Tom. She always had the best gifts (especially Star Wars)Through the years whenever we needed Pat's help she was there without question.. The business of life and my not making that extra effort prevented me from becoming closer to her which I regret very much. I am so sorry for your loss Tom, Kelly, and Tommy. Pat will be missed.